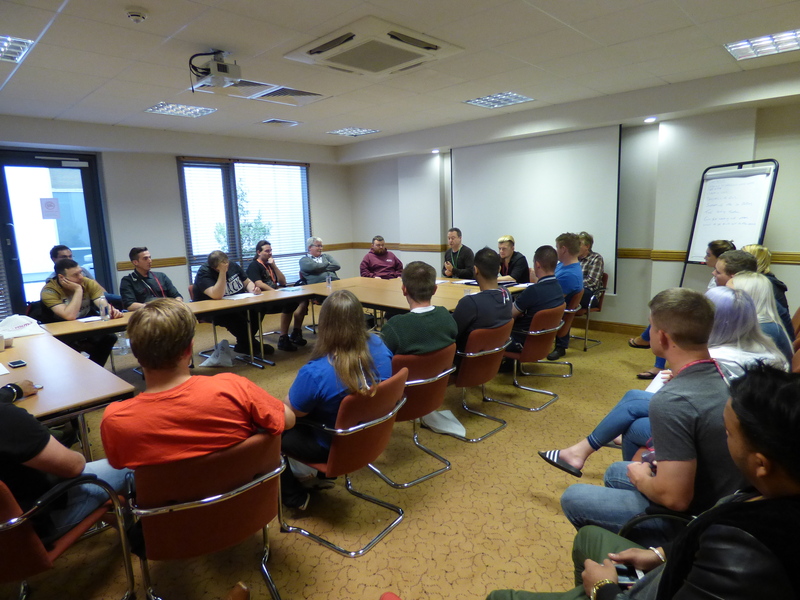 Delegates to this year’s National Youth Education Event were fired up as never before for a weekend of learning and debate following the re-election of Jeremy Corbyn to bolster the upcoming battles against the May Government and Brexit. 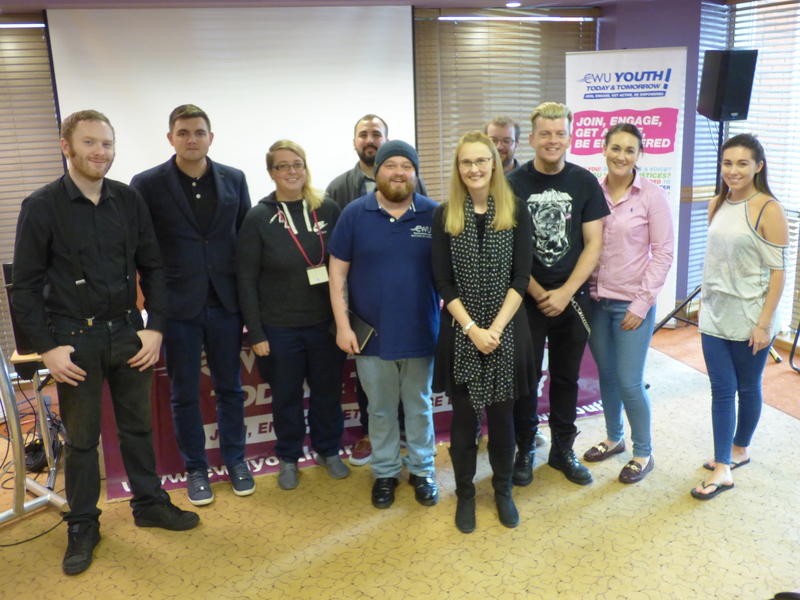 The buzz of enthusiasm in Sheffield, host city for the best-attended National Youth Education Event to date, promise to make January’s 2017 Youth Conference in Manchester a forum for pushing through some exciting and attention-demanding motions to the CWU’s governing General Conference. Guest speakers, workshop hosts and the union’s own national leaders highlighted the importance of learning from historic events within the Labour movement and the importance of standing together to counter the Tories’ divide and rule approach to power and the workplace. One overarching fact for the weekend was the knowledge that, for the first time since the industrial revolution, the new generation is going to be worse off than the previous one. However, the gathering of under-30s was buoyed by a solidarity and determination to speak up for their generation and those unable to speak for themselves. In his keynote opening address, Senior Deputy General Secretary Tony Kearns set the tone. He said that while the impact of the Brexit vote would be harshest on the current generation of CWU Youth, their union involvement would help them be a force for good. “Getting involved with a union is about making change for good. Your time is now. I want to stand behind young workers and I want them to determine what this union’s future is, because that determines how your lives are going to be. CWU President Beryl Shepherd explained that opinions of the younger members of the union were essential for influencing the way the CWU would look in the coming decades under two major future proofing projects known as “Redesigning” and “Proportionality”. “Your views would be most welcome. Your ideas about the best ways to engage with young people are crucial. Industrial roundtable discussions were led by Deputy General Secretary (T&FS) Andy Kerr andRay Ellis (Postal Assistant Secretary). Ray deputised for Deputy General Secretary (Postal) Terry Pullinger, who was representing the CWU at the UNI World Postal and Logistics conference in Dublin. Many delegates took the opportunity to ask Andy and Ray questions on specific workplace related issues and receive detailed answers over the course of two hours. Among their updates the union’s work in recent months, Andy explained the significant progress in getting facilities time for youth representatives in BT branches, and the latest on Ofcom’s review of broadband; and Ray explained how the CWU is handling Royal Mail since privatization and the progress of a campaign of industrial action by Post Office members to oppose Crown Office closures. Shadow Secretary of State for Voter Engagement and Young People, Cat Smith MP, summed up the Tory Government as looking to the past with austerity, Brexit and grammar schools; and ruling by trying to force divisions between generations, north and south and rich and poor. She contrasted this with Labour as the future, with policies of financially-accessible education for all, tens of thousands of members aged under 30 and engagement with younger voters and voters-to-be. “We want a society that will support future generations in education, in training and in the workplace and we have a historic opportunity. Young people are more politicised now than young people have been for generations. “Around three-quarters of a million young people registered to vote in the EU referendum, and then at that referendum we saw a 20 per cent jump in young people using their vote compared to the general election in the year previous. Three workshops brought opportunities for the delegates to learn about topics they were particularly interested in. Each workshop “branch” drafted motions that were proposed the next day at a mock conference. “How to use your MP” was hosted by Jon Trickett MP, Shadow Cabinet Member and Chair of Labour’s Election Co-ordinating Committee and also Chair of CWU-supported group of MPs. Jon covered topics ranging from lobbying your MP to gaining access to even the “unfriendly” ones. He encouraged the delegates to pursue representational politics, from being a councilor or school governor to being an MP. “Apartheid and International Solidarity: a trade union issue” was hosted by James Barrett Producer of the CWU-supported London Recruits. He began by showing how British union members, including postal workers, risked their freedom and their lives by smuggling campaign leaflets into South Africa and scattering them across city centres. They were also joined via Skype by Steve Marsling who took questions about his role during that time. The workshop moved on to contemporary issues including refugees in Calais and postal workers in Palestine. “The Art of Writing Motions” was hosted by CWU Standing Orders Committee member, Paddy Magill. This was an invaluable master class and inside track on how to write motions to conference that will stand up to scrutiny, carry support and potentially influence union policy. The motions brought to mock conference from the workshop “branch” sessions hit on topical issues that could be at home in any trades union or Labour Conference. (Well almost. Somehow the Youth Committee sneaked in a motion to support Donald Trump, and so they were rumbled as the Devil’s Advocate of the art of debate, influence and respect for other opinions. Naturally, the motion fell). “This conference instructs the Youth Committee to lobby the T&FSE to improve the workforce 20/20 contracts, terms and conditions to bring up to the level of previous contract. The National Youth Committee is instructed accordingly.” Hanna Williams, North Wales and Chester Combined: “It amounts to less pay, less sick pay, fewer hours…we didn’t sign the contract, it was imposed on us and sent to us in the post, saying our pay grade was ‘an admin error’”. Two generations of the CWU packed the conference room to hear from Chairperson and co-founder of the Orgreave Truth and Justice Campaign, Joe Rollin. At the time of Joe’s appearance, The Campaign was awaiting the imminent announcement by Home Secretary Amber Rudd on whether she would be going ahead with the their request for a full and independent inquiry into what happened at Orgreave coke plant near Sheffield on 18 June 1984. It happened at the height of the National Union of Miners’ strike of 1984-85, during which 165,000 people were on strike for a year, 11,313 people were arrested, 7,000 people were injured and admitted to hospital, 5,653 people were put on trial of whom 960 were sacked as a result and many were blacklisted, never to work in a meaningful job again; 200 of them were imprisoned. Joe told the delegates: “You’re the future of the trade union movement and you’ve got a lot of hard work to do over the coming years. I think we’ve got one of the most vicious, right wing Tory governments now, equally as vicious as what we had in the 1980s, if not more so in some ways. If we don’t learn the lessons from the past we’re doomed to fail in our fights for the future. This sounds like a long time ago, but I hope you’ll realise the connections to now and why it’s important that we know what happened in 1984 and the legacy it left for the trade union movement. He added: “Not just because of the injustice of what happened at Orgreave but because of the political nature of what happened during the miners’ strike, it’s important we learn the lessons. The campaigners want answers to who lay behind South Yorkshire Police’s methods of military tactics, brutality, collusion, lies and cover-up; wrongful arrests, serious injuries, denial of medical treatment, and the unlawful prosecutions of miners, whose trials collapsed through lack of evidence. No one has ever been brought to scrutiny over the catalogue of abuse, which left a community emotionally scarred and financially ruined. Making the issue particularly topical in recent months has been the eventual official condemnation of South Yorkshire police at the Hillsborough Stadium tragedy a few miles away in 1989. This year an inquest jury decided that 96 football supporters, mostly Liverpool fans, were unlawfully killed at the FA Cup semi-final policed by the South Yorkshire force. Jurors found the then match commander, Chief Supt David Duckenfield, “responsible for manslaughter by gross negligence” due to a breach of his duty of care. November 3, 2016 in EDUCATION, NEWS.